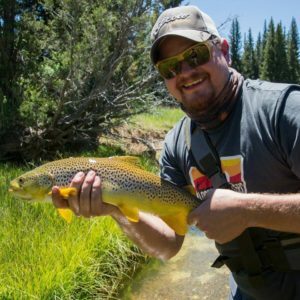 Our New Guide and a Dry Fly Fishing Video! Today’s post is two fold. First, we’re very excited to introduce to you our newest fly fishing guide, Chet Dalton! Chet is a native of Southern Utah so he knows his way around all the water. He’s a very fishy dude and fantastic fly fisherman. Check out his bio on the Guides page for a more thorough introduction! Chet also runs a great blog with his buddy Tim Sickles, called Whiskey and Windknots, along with an Instagram page by the same name. Check them out for more fly fishing goodness and some great fish photography! This brings me to the second part of the post today – I love a good fly fishing video. They get me excited every time I watch them and I just want to go fishing afterwards. Chet and Tim put this video together and knocked it out of the park! It shows you what a day of summer dry fly fishing is like in Southern Utah. We’re lucky in that we live in an unspoiled and uncrowded part of the west with some fantastic fly fishing. I really believe we’re in the middle of one of the best kept fly fishing secrets around. Want to be a part of it? Want to catch wild trout on dry flies on a beautiful summer day high in the mountains? Then call us now to reserve a spot, summer is close! Dig the new look of your blog! Keep the articles coming! It’s nice to read local fly fishing stuff. Tightlines fellas! Thanks Sam! Appreciate the support, we love your IG page and check it out often. Us local southern Utah guys need to go fishing together sometime!